Building tracks to fit combines, tractors, harvesters, carts, and self-propelled equipment. In 1972 Gilbert and Riplo, Co. sold its first set of GripTrac. 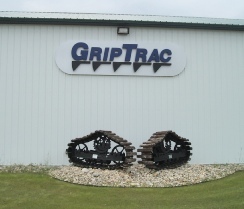 Since then, our quality engineered tracks, best known as GripTrac, have been sold to customers throughout the United States and 26 additional countries around the world. GripTrac can replace tires on most combines, tractors, grain carts or self-propelled equipment on the market with little or NO modifications. Our products make harvesting in wet, muddy fields possible. GripTrac is also manufactured for salt and tomato harvesters. Furthermore, it is adaptable to the logging and sod industries. If you have a special need our company will custom design and fabricate on spec for any machine that requires flotation and/or traction. 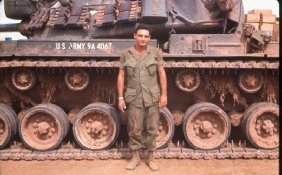 but had his first track experience driving a tank in the Army while serving in Vietnam. GripTrac reduces fuel use by 20% because they offer less rolling resistance in mud. They can be put on in 3 hours and taken off in 1 hour. Once you put them on you will notice that your machine is running smoother and easier. GripTrac does not tear up fields. Its 36” width minimizes compaction. Its 46 square feet of bearing surface on the ground gaurantees that you will stay on top of most soils. GripTrac has exclusive FloTrac design. Our quality engineered tracks replace tires in wet fields. We feel strongly that you will be satisfied with the overall performance of GripTrac.